Gathered around the Queen's Airport Medical van are staffers Robert Smith, left, medical director Donald C. Fancher, Jon Kane and Gary Pascua. Hawaii is the first state to establish airport surveillance of avian flu or other viruses that may be introduced by travelers, health officials report. The program is expected to improve the state's ability to rapidly detect, characterize and respond to the threat of pandemic flu, said Catherine Chow, U.S. Centers for Disease Control and Prevention medical officer assigned to the state Health Department. Enhanced airport surveillance was initiated through an agreement Oct. 31 between the state Department of Health and the Queen's Medical Center, said Janice Okubo, Health Department spokeswoman. The program will enable public health officials to collect nose or throat specimens from sick passengers for influenza testing, with detailed passenger information to trace contacts and begin disease control/containment activities if warranted, Chow said. Queen's operates a round-the-clock airport clinic under contract with the state Department of Transportation. Registered nurses trained to respond to emergencies staff the clinic on a rotating basis, said Kara Hughes, hospital spokeswoman. She said Queen's Airport Medical Services is doing flu surveillance on a volunteer basis "as part of our leadership and commitment to the health and safety of the Hawaii community." The airport clinic will assess a patient or someone who shows up feeling ill to see if he or she meets criteria for regular or avian flu, Hughes said. Respiratory specimens will be collected with the person's consent for testing by the state laboratory. Okubo said passengers could be referred to the airport clinic by the CDC's airport quarantine station, by an airline or from anywhere in the airport requesting medical assistance. 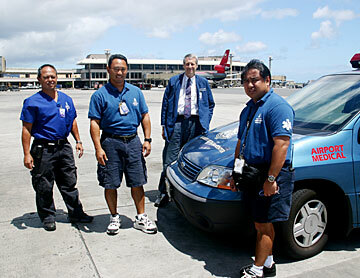 The nurses have a mini-van to travel within the airport area bounded by the ocean, Nimitz Highway, Lagoon Drive and Elliott Street. The CDC quarantine station at 300 Rodgers Blvd. also is being expanded to screen arriving passengers who may be ill. For the first time, a full-time doctor, Will Jackson, has been assigned there. State Health Director Chiyome Fukino said President Bush's proposed spending of $7.1 billion to prepare the nation for a potential flu pandemic "is a very positive thing for public health." Hawaii's health, hospital, health care and civil defense leaders have been working on preparedness plans for early detection and response to avian flu or other infectious diseases. But only the federal government can handle certain things, Fukino pointed out, such as encouraging development of technology to produce vaccines rapidly. "One problem with viral illnesses or flu is they are very smart," Fukino said. "They modify themselves to survive," she said, which is why vaccinations are needed every year. Outbreaks of avian influenza, mostly influenza A or H5N1, have been reported largely in poultry, ducks and migratory birds. The few human cases are believed to be due to direct contact with infected live poultry. Fukino noted there is controversy in the medical community about the need to stockpile a vaccine, such as Tamiflu. If the virus introduced is resistant to it, "you've got a whole stockpile that won't work for a pandemic," she said. Dr. Duane Gubler, director of the Asia-Pacific Institute of Tropical Medicine and Infectious Diseases at the University of Hawaii John A. Burns School of Medicine, said: "The key is to get programs on the ground in Asia that would allow them to monitor this." He pointed out that genetic changes in the virus that could result in a pandemic strain most likely will occur in Asia. Some U.S. dollars should be used to support Asian nations in developing disease detection systems to monitor what's happening, he said. "It's best to get it before it gets on an airplane and travels around the world." Gubler said he hoped Hawaii would be high on the list for more funding, since it is the gateway to the United States from Asia. Money would be most efficiently used to shore up the Health Department's disease detection system, improve the state's laboratory capability and emergency response contingency plans in case a disease is introduced, he said, adding that the department is working hard on the problems. "It may never happen, but you can't be sure." While avian flu hasn't reached Hawaii or the mainland, seasonal flu kills an average of 35,000 Americans annually, Fukino said. She urged residents -- especially those at risk because of age or medical conditions -- to get flu shots. In preparing for a possible pandemic or natural disaster, Hawaii is fortunate for "very good relationships" between the Health Department, Healthcare Association of Hawaii, the Hawaii Medical Association and other concerned agencies, Fukino said. Hawaii's level of disaster response will be discussed by professionals at a free public meeting from 1 to 5 p.m. Nov. 16 at the Queen's Conference Center, Punchbowl and Beretania streets. Residents are asked to call 586-4400 to register.